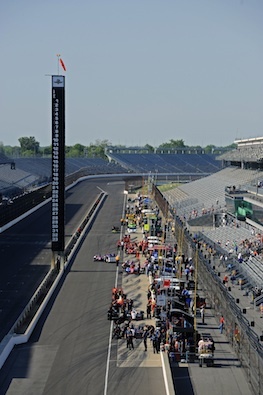 After three days of working primarily on race day setups for the 96th running of the Indianapolis 500, Team Penske got serious about qualifying Tuesday. The results produced the team’s fastest laps around the 2.5-mile Indianapolis Motor Speedway, with all three Penske drivers exceeding 220 mph. Three-time Indy 500 champion Helio Castroneves led the way with a lap of 222.025 mph in the No. 3 Shell V-Power Pennzoil Ultra Team Penske Dallara/Chevrolet. Castroneves ranked second-fastest to Marco Andretti of Andretti Autosport, who was clocked in 40.2367-seconds and 223.676 mph in the No. 26 Team RC Cola Dallara/Chevrolet. Marco’s lap was fastest of the four days of practice for the May 27 event. James Hinchcliffe (221.864 mph) was third-fastest in the No. 27 GoDaddy.com Dallara/Chevrolet also fielded by Andretti Autosport. Graham Rahal’s No. 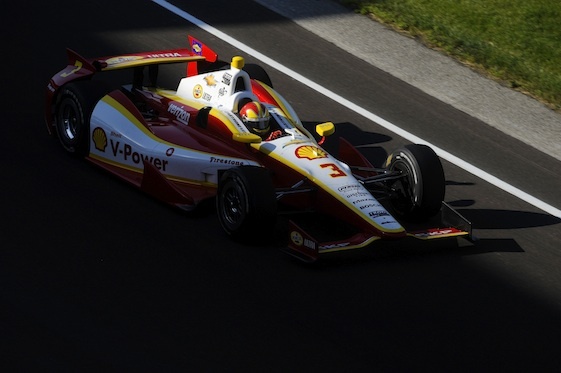 38 Service Central Dallara/Honda was fourth- fastest (221.855 mph) with Ryan Hunter-Reay fifth in the No. 28 Team DHL/Sun Drop Citrus Soda Dallara/Chevrolet (221.814 mph) fielded by Andretti Autosport. Led by team founder Roger Penske, Team Penske is the most successful organization in Indy 500 history with 16 poles and 15 victories. Team Penske has won the first four street/road-course events of the 2012 IZOD IndyCar Series season, with Will Power on a three-race streak after Castroneves claimed the season-opener. The top 25 cars were separated by one second as teams continued working on various simulations. Pole Day qualifications are set for Saturday, when all teams will be afforded an extra 40-50 horsepower for their respective Chevrolet, Honda and Lotus 2.2-liter V-6 engines via additional turbocharger boost approved by sanctioning body INDYCAR. Practice will resume Wednesday at noon. A total of 35 cars are at the Speedway, with 35 passing technical inspection. Thirty-one drivers have been on the track to-date, turning 1,602 laps Tuesday and 4,632 laps this month. James Jakes, driver of the No. 19 Boy Scouts of America Dallara/Honda fielded by Dale Coyne Racing, turned 100 laps Tuesday, most of any driver. There were five cautions for a total of 45 minutes.